Redshirt sophomore forward Sarah Overcash faces off with a George Mason player earlier this month. Currently sitting in a three-way tie for third place, women’s basketball (8–12, 5–2 A-10) will look to cap off a strong 6–2 showing in the month of January with a Thursday matinee against second-place Davidson (11–8, 5–1 A-10). The Wildcats have won all three of their road games in conference play, upping their record in hostile environments to 5–6. Thursday’s contest will be one between the conference’s best and worst offensive teams. Davidson leads the league with 67.6 points per game, while the Colonials sit in last at 52.1 points per game. The Wildcats are also the Atlantic 10’s newest team, playing in their fifth season as a member of the conference. The Colonials have played them once every season since they joined and hold a perfect 4–0 record. Senior guard Mei-Lyn Bautista has been on a tear, posting back-to-back 20-point performances against VCU and Duquesne. She has scored in double figures in four consecutive games with the long ball as her weapon of choice, shooting 40.0 percent from distance over the last seven games. She has been equally potent on defense, as she ranks second in the conference with 2.1 steals per game. Bautista has averaged 9.6 points per game in her three previous contests against Davidson, all of which have resulted in victories for the Colonials. Sophomore forward Neila Luma has also been playing at a higher level, averaging 14.3 points per game in conference play after posting just 10.8 points per game during the team’s nonconference slate. As a team, the Colonials’ field-goal percentage, three-point percentage and free-throw percentage have all increased in conference play. They are playing their best basketball of the season at the right time, but they will need Luma and Bautista to continue to lead the team in scoring against Davidson’s elite offense. If the Colonials want to win, GW will have to improve its offensive rebounding numbers, which have decreased in January, and avoid foul trouble in the front court, where the Colonials lack height and depth. Although Davidson has been known for its top-ranked offense, the team’s defense has markedly improved in the new year. The Wildcats have yielded just 59.0 points per game to their opponents since the turn of the calendar. 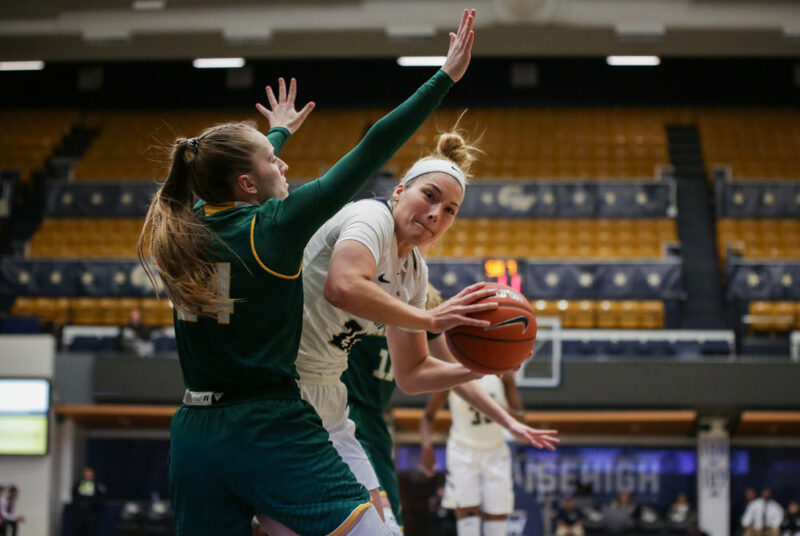 Picked to finish 11th in the A-10 women’s basketball preseason poll, Davidson was just 6–7 in its relatively weak nonconference schedule, but like GW, has turned it around in January. The Wildcats return 10 scholarship players after losing three letter winners in the offseason, signifying that second-year head coach Gayle Coats Fulks has the advantage of experience and roster continuity on her side. Davidson’s offensive attack runs through its backcourt, featuring four guards who are all capable of scoring in double-digits: senior guard Kianna Speight, senior guard Justine Lyon, sophomore guard Katie Turner and sophomore guard Sarah Donovan. Donovan, who has increased her scoring average from 7.4 points per game to 13.2 points per game, is going to be the primary defensive focus for the Colonials. The 6-foot guard from London, Ontario also collects 8.2 rebounds per game, which ranks second in the A-10, and is shooting 45.8 percent on the season, which ranks fourth. She has increased her field goal percentage to 55.1 percent in conference play and figures to be a force in the paint. Lyon, who was named to the All-Conference Preseason Second Team, bounced back from a three-point performance against Massachusetts with a team-high 15 points Sunday against Fordham. The Durham, N.C. native is averaging 14.3 points per game in conference play. Turner, Davidson’s point guard, leads the conference in assists per game with 4.6 and is second in assist-to-turnover ratio with 2.3. With 1.7 steals per game, Turner plays a similar style to Bautista, with most of her points coming behind the three-point line. And shooting 38.9 percent from three-point range, Spaight is another three-point shooter for freshman guard Maddie Loder and Bautista to worry about. The Colonials have held some of the team’s best offenses to below-average scoring as of late. But Davidson, like the Colonials, is coming in with positive momentum with road victories over some of the league’s best teams, and has more weapons on the floor at any given time. The Colonials will have a good shot at keeping up, but the Wildcats should remain unbeaten on the road in conference play on Thursday.